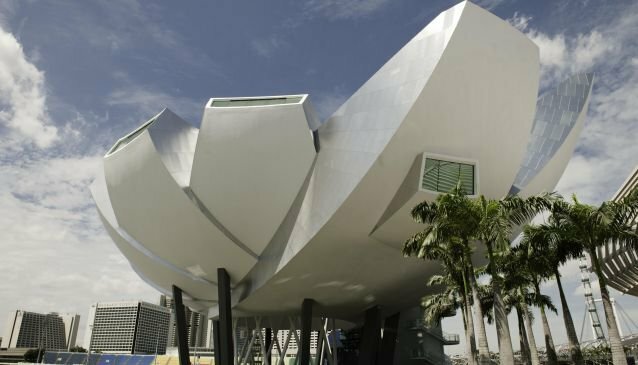 The ArtScience Museum, representing a lotus flower as a symbol for welcome, is located near the iconic Marina Bay Sands hotel, The Shoppes mall, the Helix bridge and the Singapore Flyer. It is certainly a sight not to be missed. The museum showcases internationally traveled exhibits such as 'Andy Warhol - 15 minutes eternal' or 'Harry Potter - The Exhibition'. With influence from art and science, to media and technology, to design and architecture this museum is home to well over 50,000 square feet of art for all ages. A museum's in house exhibit ArtScience is 'A Journey Through Creativity', which acknowledges the emerging field of ArtScience. In takes people through the uniting voyage of art and science and how with observation and instinct art takes cultural shape. Visitors of the ArtScience Museum have been able to connect, explore and become inspired through the three galleries: Curiosity, Inspiration, and Expression. The museum has two shops and a small cafe that offers drinks and small snacks. Nearby restaurants along the Marina Bay Promenade offer splendid views of the Central Business District and the Esplanade. It is also a romantic spot in the evening with the Marina Bay laser show being the highlight each evening. For current exhibitions check out our Events Page.